Back in the roaring Sixties and Seventies, literary criticism and especially the philosophy of literary aesthetics and of socio-political analysis through literary texts acquired a distinctly ‘cool’ status. At last, academia was coming out of the dusty cupboards, climbing down from its ivory towers and marching into the streets arm in arm with the most radical minds and unruly spirits of the day. Forget existentialism and the Café de Flore. To study literature daringly and minutely, almost geekily, with grand polyvalence and a polyphonic resonance, was the philosophical object of desire of the day, and to flex your intellectual muscles in that field was as close to being a wild child, a maverick and a rebel as an intellectual could aspire to be. Figures like Derrida, Rorty, Stanley Fish, Paul de Man, Martin Heidegger, Michel Foucault, J-F Lyotard, Jean Baudrillard, Fredric Jameson and many others who followed their blazing trail attained the status of near cult figures, raising hosts of disciples and detractors with equal fervour. They would be revered for breaking the rules of cogent thought, of revealing the original questions behind what they claimed to be an almost calcified hermeneutical hegemony and tradition (Ricœur) and they would be accused of opposing rational discourse (Habermas), or even of demolishing our very ability to think and understand (Ellmann). Their effect on our understanding of the potential, power and nature of analytical thinking would be indelible. For better or for worse, we are all the legitimate or unacknowledged children of that particular cultural and intellectual breed. As much anarchists as the unyielding proponents of a super-powerful new order, they would teach a new generation of theorists how to be dastardly risk-takers, spectacularly skilled anatomists, cross-disciplinary masters. Very resolute and awesome movers and shakers. To deny them their formidable worth would be to doom our own minds to a claustrophobic, infertile and rather dull inertia. Yet it is also easy (and treacherous) to be a little too dazzled, to become too eagerly lured and too readily converted. 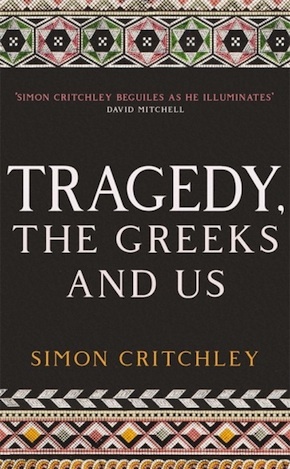 The true thrill is to think with them but not necessarily always like them, and this is a thrill a reader will find in riveting display in Simon Critchley’s new book Tragedy, the Greeks and Us. The Hans Jonas professor of philosophy at the legendary New School of Social Research in New York, Critchley is an unabashed deconstructionist who argues that “fiction can give us a different experience of the truth [… because…] the world is what we make of it.” More specifically, the thesis here is that “the lie of tragedy is its truth.” This is not necessarily an oxymoron or a relativistic perspective. It is, nonetheless, emphatically a non-prescriptive one, an anti-deterministic and certainly a postmodernist and revisionist one. It predicates an analysis and a journey which, according to Critchley, offer access to something much deeper, to another side not only of reason and language, but also of being. And of all types and genres of fictionality across human time, tragedy, as the Greeks created and fashioned it, lived it and bequeathed it to us, holds a particularly special and unique place. As he puts it, with a certain evocative beauty, it “shows us what is perishable, what is fragile, and what is slow moving about us.” It offers us the closest, most dramatic and revealing encounter with ourselves, with the other, with non-being, with non-meaning, even. “Tragedy for me is the life of scepticism, where the latter is the index for the world, an orientation that seems to emerge from the disorientation of not knowing what to do.” Like Sophocles’ Oedipus, we are blind not only to our fate but also to ourselves. It is certainly, in Critchley’s hands, a very poetic kind of scepticism, a rather intoxicating dance with words, ideas, texts, the vortex of the life of the mind in the world, and perhaps beyond it. Critchley is an authoritative reader, and, though not a classicist, he proves an erudite, scholarly guide through layers of myth, reason, history and their interpretation, and overall a truly beguiling one. He stops carefully at words and actions that matter, draws the bigger picture from glimpses of fragments and shreds of textual evidence where the fuller body has been lost down the dynes of time. Over the course of a lengthy, meticulous analysis, conveniently parcelled into short, sharp-paced sections, alike to the bullet points of a manifesto, he conjures up an irresistible sense of wonder, with real and contagious zeal and passion. Interestingly, Critchley is a feisty, uncompromising moralist, for all his assertions of being a “philosopher of the dangerous perhaps”, or, rather, he is so because of it. He evinces a very strong sense of self and voice, sometimes almost to the exclusion of a sense of audience. Yet this in no way delimits the powerful resonance of his text. In true Foucauldian fashion, he lays out his “twelve theses on tragedy” that effectively claim to deconstruct the genre as we know it. Some are rather sweeping claims, others perhaps not quite as original and groundbreaking as he would have us believe, and there is a proclivity for seeming contradictions. The argumentative fabric however is tight, with a nice reflectiveness that is often reminiscent of Arendt, Adorno or even Levinas, verbally affluent, muscular and provocative. One concern, in what is unquestionably a spectacularly engrossing analysis, is the theoretical agenda, the reliance and adherence on set terms and cliché stereotypes that do not fully express the substance of the matter under scrutiny, even as they purport to be equal to the steps of an algebraic analysis. Here, however, the QEDs are starkly absent, ceding their place to elaborate and masterful sleights of hand that induce us hypnotically to proceed from A to B with a kind of drugged, unscrutinised fearlessness. Critchley is at his best in his analysis against exoticising the Greeks, and against totemistic, anthropological, or ethnographical discussions of tragedy; also in his refreshing resurrection of Pierre Vidal-Naquet and Paul Vernant, perhaps the most surreptitiously subversive éminences grises of French scholarship. Together with Anne Carson, they are his modern wayfarers and guides, the compasses along the unchartable waters he means to navigate. Drawing strength from their strengths (and weaknesses), Critchley brings back to the foreground the kind of philosophical, philological discourse that is unperturbedly in thrall to its own beauty and complexity, to the power of its words to move us and to transfix us. He is a particularly gifted wordsmith, an astute orator, a shrewd and learned disputant. Those who encounter tragedy for the first time on the pages of his book will not fail to be bewitched. For those familiar with many of the topoi and texts, ancient and modern, with the more academic scholarship, the encounter might be a little more tempestuous and intellectually, ethically bracing. As tempestuous and bracing perhaps as the encounter between Socrates and Gorgias, or between Plato and Aristotle and the Sophists, an encounter which lies at the backbone of Critchley’s analysis and way of reflection. An almost mystical figure (we know surprisingly little about him, his texts have been mostly lost, and what survives has been corrupted by copyists, which leaves us relying on paraphrases and summaries included in the work of other authors), Gorgias changed the Greek world once and for all upon his arrival in Athens as an ambassador from Leontinoi, a Greek colony in Sicily. He shook the very foundations of the way the Western world would think, and also speak about thought, he redefined the very purpose of speaking and of thinking itself. He gave us rhetoric not merely as the art of speaking (a category that had the careful approval of both Plato and Aristotle), but as an art (the ultimate art) that was complete in itself, defiant of ethical or strictly logical rules, and all-encompassing. It is a grand assertion. A promise of open-endedness, of almost dizzying intellectual freedom and an unbridled imagination to reread, reconstruct, reinvent past, present and future. 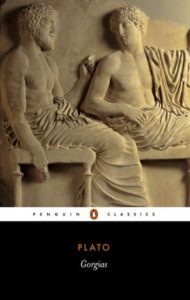 Sadly, it lacks material foundations, both in the texts themselves and in the role they played within Athenian society, in the classical world, as the reflectors of our own humanity, our socio-political and historical identity. Greek tragedy is full of aporiae, of unsolvable moral questions troubling or devastating the protagonists; these literally lock the audience into a position of supreme responsibility and responsiveness, an archetypal duty to respond; it is rife with the voices of the many and the few, the leaders and the followers. It is a dissenting voice of wisdom or despair in political climates where the ambiguity, the sophistry of the polis’ vision and ambition was propelling the citizens towards a catastrophic direction. It is above all a lesson in how to be human in the profoundest and simplest sense of the word. The two most fundamental principles, ecstasis and methexis, were exercises in empathy, in tolerance and understanding; in undoing the blindness of bigotry, egocentrism, gender, race or social bias. Tragedy does not need a rereading or a revision; it requires close and honest listening to all that it has to tell us. 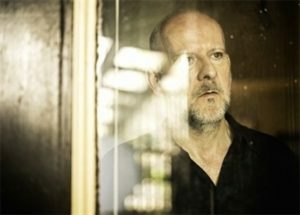 Simon Critchley has published books on a wide expanse of ethical and philosophical subjects, including the bestselling The Book of Dead Philosophers, his cult novel Memory Theatre and his memoir-analysis of David Bowie – On Bowie (Serpent’s Tail, 2016). He is Hans Jonas Professor of Philosophy at the New School for Social Research in New York, and series moderator of ‘The Stone’, a philosophy column in The New York Times. Tragedy, the Greeks and Us is published in hardback and eBook by Profile Books.